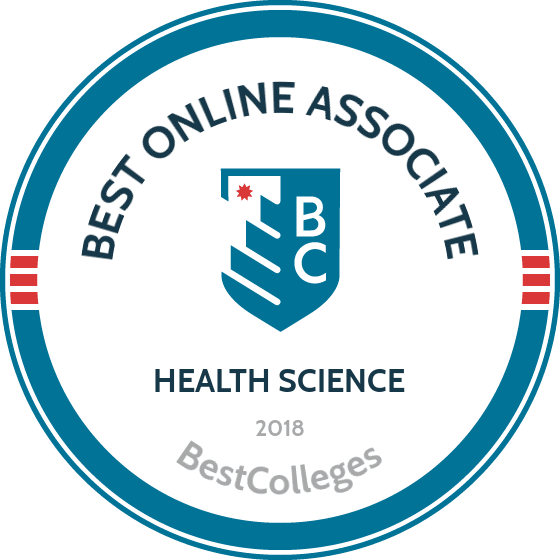 What are the Best Online Associate in Health Science Programs? What Else can I Expect from an Online Associate in Health Science Program? The Bureau of Labor Statistics (BLS) projects that employment in the healthcare field will grow by 18% between 2016 and 2026, making it one of today's fastest-growing areas. Over that period, about 2.4 million jobs will be added to this field, including many technician and support positions, which can be filled by individuals who earn a health science associate degree online. Matriculating now can help you enter this field quickly and take advantage of this period of rapid growth. The sooner you begin your studies, the sooner you can find employment and increase your earning potential. Located in Albany, New York, Excelsior offers a competitive online health science associate degree. This associate of science in health sciences degree is a practical program for working professionals, especially those who have already earned college credit at other schools or completed healthcare training in the military and wish to advance their careers. Excelsior helps distance learners make the most of their limited time by offering reduced tuition and a flexible, asynchronous course schedule. Graduates of this program can demonstrate effective oral and written communication, apply critical thinking in relation to healthcare topics, and explain the healthcare delivery system in the U.S. In total, degree candidates must complete 60 credit hours to graduate, which typically takes full-time students two years. While this degree is an open-enrollment program, applicants must hold a GED or high school diploma. All distance learners pay the same tuition regardless of whether they are state residents. Gulf Coast's associate of arts in liberal arts with a health science option prepares students for upper-division studies in health science or professions in the health service field. Located in sunny Panama City, Florida, this program offers specialty concentrations in aging studies, allied health, communication, healthcare administration, ethics, medical information technology, and psychology of health. Online course delivery may be synchronous or asynchronous depending on the class. This 60-credit degree often takes full-time students two years to complete. Tuition per credit is the same for all learners seeking an associate degree in health science online regardless of their location. While enrolled, all students must maintain a minimum grade of a "C" or higher in order to remain in good standing with the department. Financial aid is available in the form of internal and external scholarships as well as state and federal grants, federal student loans, and work-study programs. Located in Washington, D.C., GW offers an online health science associate degree specifically designed for service members in healthcare occupations who wish to enhance their skills and earn the credentials necessary to either pursue further education or be eligible for a promotion in the military. This associate of science in health sciences degree positions distance learners to enter non-clinical bachelor's degree work, as the general education and elective requirements easily transfer into four-year colleges. In total, students must complete 75 credit hours to graduate. Courses are delivered asynchronously, allowing distance learners maximum flexibility to complete their course requirements. Active-duty military personnel receive a substantial discount on tuition in this program. All other distance learners pay the same tuition rate regardless of their state of residency. GW accepts transfer credits from classes passed with a "C-" or higher from other regionally accredited institutions. With 10 locations along the coast of Florida, SPC offers a competitive online health science associate degree. This associate of science in health services program prepares degree candidates for several speciality areas in the field, including dental hygiene, emergency medical services, nursing, radiology, respiratory care, and veterinary technology. SPC students learn the fundamentals of healthcare delivery, pertinent medical terminology, and administrative functions required of any entry-level health services professional. Over the course of two years, learners must complete a total of 60 credits in order to graduate. Online learners residing in Florida may easily transfer credits earns through this program toward a bachelor's degree at one of Florida's 10 public universities. This online program is open to all students regardless their state of residence, except those who reside in Massachusetts, Minnesota, and Nevada. Those living outside of the U.S. may be eligible to take classes and obtain a degree from SPC, provided they demonstrate proficiency in English and meet other standard requirements listed on the department website. Designed to provide an advantageous starting point for online learners seeking careers in healthcare, UIW offers a strong health science associate degree online. Students select a specialty concentration in either administration or general military training. Online learners who choose a specialty in administration are prepared for a variety certifications, including electronic health records specialist, billing and coding specialist, medical administrative assistant, and rhythm analysis technician. The general military training specialty prepares students for entry-level healthcare careers or to pursue further education. This Catholic-affiliated university delivers its coursework asynchronously. Degree candidates must have already completed 15-20 hours of college work or appropriate military experience credit in an allied health area in order to be admitted to this program. This 60-credit degree takes most full-time students two years to complete. Both residents and non-residents pay the same tuition for their online education. Active military personnel and veterans receive a tuition discount. Located in San Dimas, California, Christian-affiliated Azusa Pacific offers an associate of science in health science degree for distance learners interested in furthering their healthcare career. This accelerated online program trains students to work in medical environments, which often means dealing with sensitive information. Azusa Pacific's curriculum pays careful attention to culture-centered and diversity issues that working professionals encounter on a daily basis. Graduates of this Azusa Pacific program often pursue careers as medical assistants, dental hygienists, and various other positions in clinics, hospitals, and gerontology agencies. Over the course of two years, or 60 credit hours, students gain the essential technological skills used by entry-level medical professionals. The school delivers its coursework entirely online in both synchronous and asynchronous formats, depending on the class. All students, regardless of location, pay the same tuition rate for this online health science associate degree. Located in Ogden, Utah, Weber State offers an associate of science in health sciences degree. Online learners choose from six different specialty tracks: general health sciences, dental hygiene, medical lab sciences, nursing, radiologic sciences, and respiratory therapy. Graduates of this diverse program can become healthcare technical writers, medical sales associates, and medical social workers. Regardless of their chosen specialty track, Weber State students gain an in-depth understanding of the language of medicine, anatomy, and the response of the biological system to diseases. Required health sciences courses include multiple human anatomy and physiology courses, cases studies in health science, and introductory courses in pathophysiology and pharmacology. The 60-credit associate degrees offered in this open-enrollment program generally take full-time students two years to complete. With the wide variety of specialty track options, Weber State helps online health science associate degree candidates tailor their degree to meet their professional goals. Located in Paramus, New Jersey, BCC offers an associate of applied science in health sciences degree. This program is designed for working professionals who have earned the equivalent of one year of study through their experience in the field. The curriculum for this online health science associate degree assumes that distance learners currently hold certification or licensure in a health profession discipline, such as dental assisting, diagnostic medical sonography, nursing, office assisting, or radiology. Additionally, this certification or licensure must be approved by the accrediting agencies of BCC's health program. While earning their degrees, students choose from specialty tracks that supplement their healthcare knowledge. The specialty determines a student's trajectory through the online program. Though out-of-state residents pay double the tuition rate as those residing in Bergen county, BCC remains an affordable option for students seeking a health science associate degree online. Located in Cheyenne, Wyoming, LCCC offers an associate of science in health science degree for online learners seeking a generalist curriculum that provides a solid introduction to the medical field. This program offers students the flexibility to move into various healthcare career pathways. All students work closely with advisors to find the best academic route to meet their educational needs. Full-time degree candidates complete the required 62 credit hours in two years. From introductory courses in medical terminology and general biology to more specialized instruction in physiology and healthcare ethics, online students learn a wide range of critical materials in only four semesters. All degree seeking students must submit their applications at least two weeks prior to the start of classes. The school requires applicants to submit a high school diploma or GED. While out-of-state online learners pay higher tuition than in-state students, LCCC offers a competitive online program with affordable rates. Located in White Bear Lake, Minnesota, Century College is a two-year public university offering an associate of science in health sciences. This program offers a strong introduction to the healthcare field. Students in this associate program often continue their education in bachelor's programs in an array of health sciences majors at four-year colleges and universities. In fact, Century College's online health science associate degree is designed to transfer to all Minnesota State universities that offer related bachelor's programs. Associate degree candidates must complete 60 credit hours at Century College. Most online courses are delivered asynchronously without any required on-campus meetings. Full-time students can expect to finish in two years. Students must earn a "C" or higher in both major-specific and general education courses in order to remain in good standing with the department. All students seeking an health science associate degree online pay the same tuition rate, regardless of their residency status. Located in Austin, Minnesota, RCC's associate of science in health sciences provides a base of introductory knowledge for individuals interested in transferring to a bachelor's program. During the course of four semesters, degree candidates take 60 credits, covering topics in general biology, composition, psychology, and statistics. The school delivers its coursework synchronously, occasionally using ITV technology (interactive television), which allows students to see and participate in courses in real time. Graduates of this online health science associate degree program gain college-level writing and research skills in addition to the specialized health sciences knowledge necessary for entry-level employment. All online students pay the same tuition rates regardless of their state of residence. Scholarships are available through RCC and external sources. Students do not need to qualify for financial aid in order to be considered for scholarships. Located in Madison, University of Wisconsin Colleges offers an online health science associate degree that focuses on introductory instruction in biology, chemistry, and psychology. This associate of science with a health services emphasis is designed for students who plan on pursuing further education, especially if they are considering one of the colleges in the University of Wisconsin network. The associate degree requires students to complete 60 total credits. Of that total, 16-20 credits comprise the health sciences emphasis. Students choose from a variety of course options to satisfy their major requirements, which allows them to select classes that best fit their professional goals. All students must pass a university-wide assessment of general education skills which evaluates analytical, quantitative, communication, and aesthetic skills expected of associate degree holders. Additionally, each academic department within the UW Colleges network assesses discipline-specific proficiencies. Students must maintain a "C" average or better in required courses in order to remain in good standing with the department. Located in St. Paul, Minnesota, Saint Paul College offers an associate of science in health sciences broad field degree. This program provides students with the foundations needed to transfer into bachelor's programs in the health sciences. The curriculum accommodates students who have not yet decided which specific healthcare field they intend to pursue. Historically, many graduates of this program have gone on to seek bachelor's degrees in a variety of health-related areas, including community health, nursing, dental hygiene, social work, and health education. Students must complete a total of 60 credits to earn this online health science associate degree. Students can expect to spend four semesters, or two academic years, in the program. The school delivers its asynchronous coursework in both hybrid and online formats, and accepts transfer credits from other accredited institutions. Students can begin this program as full-time or part-time students in the fall, spring, or summer semesters. Located in the borough of Media, PIT offers an associate degree in health sciences. Students choose one of four emphasis options: allied health studies, practical nursing, medical billing and coding, or clinical medical assistant. The program curriculum emphasizes science and mathematics. Degree candidates take courses in anatomy, physiology, chemistry, and biology, along with elective courses in topics like psychology and healthcare management. Program graduates often move on to more specialized programs, such as physical therapy or nursing. Additionally, those with an associate degree in health science often enjoy an increase in salary. The school delivers its coursework online or in a hybrid format. The program typically takes 18 months to complete. All online students pay the same tuition rate regardless of their state of residency. Applicants can apply for financial aid in the form of grants, scholarships, loans, and work-study programs. As you compare various online health science associate degree programs, you will likely notice many similarities. However, although each program's goal is to teach you the skills needed to succeed in this field, the specific coursework and learning outcomes vary depending on the school or program. The exact list of classes offered by a given program differ somewhat, but most students who earn an online health science associate degree cover many of the same subjects. The list below describes a few of the common courses encountered by learners in this field. Medical Terminology: Individuals pursuing a health sciences career must become familiar with the terminology used by medical professionals. This course teaches students the basic jargon needed to proceed with studies in this field. The professional language covered in this course should come in handy in any type of medical-related job. General Psychology: An introduction to the principles of psychology teaches learners to work with patients more effectively by helping them understand how the stresses of medical issues and treatment affect patients and their loved ones. This allows workers to relieve some of the fear and/or apprehension of their charges. Human Anatomy and Physiology: Any medical professional needs to know about the human body and how it works. This introductory course typically covers a wide range of topics, including anatomical terminology, basic biochemistry, cells and tissues, and the organ systems of the human body. How Long Does it Take to get an Online Associate in Health Science? A number of factors affect the amount of time it takes to earn an associate degree in health science online. Most associate degrees consist of around 60 credits, although some specialties require students to complete additional credits. Many programs operate on a traditional fall/spring/summer schedule. These may use a cohort model, where students begin classes together at the beginning of a semester and complete their studies at the same pace as their peers. Other programs offer accelerated or asynchronous scheduling, which allows individuals to start courses more frequently and complete coursework at their convenience. Full-time students typically complete their program in about two years, or four semesters. Before you enroll, be sure to look at the type of schedule a program uses to make sure it fits with your needs. As you compare programs offering an associate degree in health science online, make sure to look at each school's accreditation information. Attending an accredited school is crucial when pursuing any degree. Accreditation proves that an institution or program has been reviewed by a recognized body of experts who verify that certain academic and admissions standards have been met. This gives students peace of mind that their education is legitimate and informs future employers that applicants have been adequately prepared for work. Two types of accreditation exist: regional and national. Regional accreditation holds more prestige and is administered by a group of accrediting bodies that each oversee several states in a designated area of the U.S. Alternatively, national accreditation is typically reserved for religious schools or institutions that specialize in technical or vocational training. Just as accreditation agencies oversee the quality standards of colleges and their programs, those agencies also receive oversight from the U.S. Department of Education (ED) and the Council for Higher Education Accreditation (CHEA). The CHEA is an organization with a membership of approximately 3,000 higher education institutions. It helps regulate the industry by reviewing and affirming the quality of education provided by schools seeking accreditation. The ED also reviews accreditation agencies to ensure they uphold acceptable standards. This quality assurance ensures that the federal financial aid received by students at these schools goes toward a legitimate education. You can find a list of all accredited schools on the websites of the ED or CHEA. What Can I Do With an Associate in Health Science Degree? Graduates who earn a health science associate degree online can pursue a variety of career paths. Some of these jobs involve working long hours in intense environments, while others have more regular schedules and a calmer atmosphere. You can also work directly with people seeking help or be more removed from patient care. Medical laboratory technicians usually work in a clinical environment, such as a hospital or doctor's office. Their responsibilities include helping collect bodily fluids and tissue samples from patients. They take these samples to the lab, perform analytical tests, and enter results into a patient's medical records. Physical therapist assistants typically work under the supervision of a physical therapist in their office or in a hospital or other clinical setting. These professionals work with recovering patients who have physical issues caused by injuries or illness. Assistants may perform duties that include helping and observing a patient as they perform prescribed exercises. Diagnostic imaging workers include medical sonographers, cardiovascular technologists and technicians, and vascular technologists. They work at testing facilities, doctor's offices, or hospitals, where they perform various types of tests including sonograms and electrocardiograms (EKGs). These procedures record images of a patient's body, creating a visual aid to help doctors with their diagnosis. Many individuals who earn an associate degree in health science online opt to continue their education and earn a bachelor's degree. This may be prudent if you want to specialize in a given field or advance into management. If that is the case, pursuing a bachelor's degree may be the right path for you. Professionals who earn a bachelor's degree typically see their earning potential increase, and they may qualify for higher-level jobs with more responsibilities. Bachelor of science in health sciences: Many health science bachelor's programs help students who already hold a health sciences associate degree pursue a leadership track. This track readies individuals for a career in management and covers topics such as managerial strategies, administrative practices. Many programs also offer other areas of specialization. Bachelor of science in nursing: Professionals can become registered nurses without acquiring a bachelor's degree, but a four-year degree is helpful for advancing within the field of nursing. These degree holders also qualify for more jobs and earn a much higher salary. This degree also serves as a step towards securing a master's in nursing, which is often required to assume management positions. Bachelor of science in nutrition: According to the BLS, the demand for nutritionists and dieticians is expected to grow by 15% over the next decade. An associate degree in health sciences can be a stepping stone towards a bachelor's degree in nutrition. Individuals in these programs can specialize in areas such as dietetics, wellness, and food science. As in most fields, graduates with an online health science associate degree can expect their median salary to grow as they advance in their careers, often increasing by 20-25% over the course of a long career. These tend to be full-time positions that include benefits such as health insurance. Individual salaries for these positions vary based on a number of factors. The specific workplace, city and state where a job is located, and the amount of experience a worker has all influence their pay. Securing professional certifications can also increase the earning potential for certain positions. Joining a professional organization in your chosen health sciences field can provide access to helpful career-building tools. These organizations usually have special features or benefits aimed at current students and recent graduates, in addition to seasoned professionals. Such benefits include career services and job boards to help individuals find work, as well as professional networking opportunities that include local meetings, annual conferences, and other educational programs where members can earn continuing education credits. The ASCLS is an organization for healthcare professionals, including medical laboratory technicians. It provides many benefits, such as continuing education programs (both online and in person), professional certifications, and access to various publications and a career center. Diagnostic imaging workers can join the SDMS, which offers benefits that include opportunities to earn continuing medical education credit, a job board, and access to publications containing the latest developments in the field. The society also offers resources specifically geared towards current students. The AST works on public policy advocacy relevant to the profession and offers a range of services, including the opportunity to earn continuing education credits and certifications. Most students take advantage of some type of financial aid to help pay for their degrees. Scholarships, loans, grants, and work-study programs may all be viable options. Because the demand for workers in the healthcare field is high, many scholarships are specifically aimed at health sciences students. The first step to understanding your full range of financial aid options is to fill out the Free Application for Federal Student Aid (FAFSA) form, which determines your eligibility for federal grants.